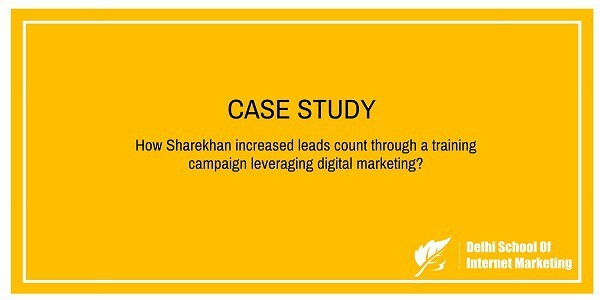 Case Study:How Sharekhan increased leads count through a training campaign leveraging digital marketing? Home > Blog > Blog > Case Study:How Sharekhan increased leads count through a training campaign leveraging digital marketing? What you will find in this casestudy? 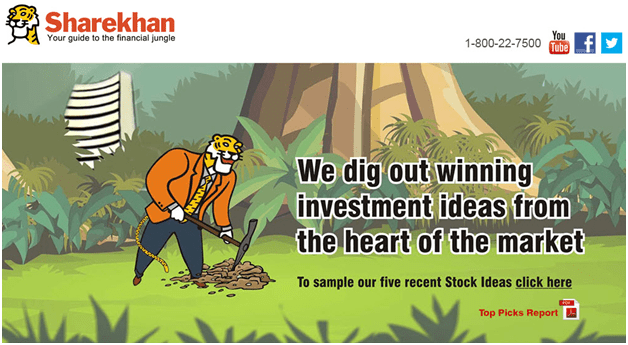 Sharekhan is one of the top retail brokerage houses in India with its strong presence over the web. The company provides equity based products. The platform provides online trading, investment, and stock marketing. Launched by Shripal Morakhia in the early 2000 as an online trading portal, Sharekhan has today a pan-India presence with over 1,529 outlets serving 950,000 customers across 575 cities. It also has international presence through its branches in the UAE and Oman. Sharekhan offers services like portfolio management, trade execution in equities, futures & options, commodities, and distribution of mutual funds, insurance and structured products. Sharekhan is a member of the Bombay Stock Exchange, the National Stock Exchange and the country’s two leading commodity exchanges, the NCDEX and MCX. Sharekhan is also registered as a depository participant with National Securities Depository and Central Depository Services. Sharekhan has set category leadership through pioneering initiatives like Trade Tiger, an Internet-based executable application that emulates a broker terminal besides providing information and tools relevant to day traders. Its second initiative, First Step, is targeted at empowering the first-time investors. Sharekhan has also set its global footprint through the “India First” initiative, a series of seminars conducted by Sharekhan to help the non-resident Indians participate and benefit from the huge investment opportunities in India. In 1992-93, when foreign investment was flooding in, Shripal with his brother Shreyasrevived their family business, set up investment banking unit SSKI, and then launched the online trading platform Sharekhan in the year 2000. It was a tough time for them because they didn’t have the financial muscle to run that large an organization. With 7 percent market share in terms of number of accounts, Sharekhan is the third largest retail brokerage firm in India after ICICIdirect and Kotak Securities. Today Sharekhan is one of the most well-known online brands in India and has been constantly profitable over the past 15 years. Sharekhan increased its number of leads by implementing a strategy with the help of their business team. They started “Sharekhan Ignite”a training program to increase the number of leads by increasing brand awareness and online reputation. Sharekhan started an online training class on equity trading,forex trading,commodity market trading,futures & options trading. The business development team worked in a progressive way by launching this campaign to train people about how the share trading market works. A wonderful webinar “Ignite”was started for customer attraction through digital marketing. “Ignite” program was started using digital marketing as it was very less expensive, new in market and awareness of stock market. Implementing the above strategy of Ignite, Sharekhan became the second largest stock brokerage portal. Its social media platforms like Facebook and Twitter saw a tremendous growth. The Facebook page of Sharekhan has gathered 36,940 likes and twitter tweets have been up-to 32k. Also the follower on Twitter has reached to 18.9k. Other social media platform for video promotion i.e.its YouTube channel has over 3630 subscribers with more than 650,000 views. Sharekhan marketing team is working day and night to leverage the super power of social media platforms.